When the sun rises on a new day – most people think of that as a good thing. For eons of time, the rising sun has been a wonderful thing - heralding a new day with the promise of life and renewed opportunities. But lest we forget, our sun is actually a flaming, violent, gravitationally bound thermonuclear explosion that will continue on for billions of years and so large, you can drop in a million earths with room to spare. What we actually count on without even thinking about it is the sun’s stability. We expect it to shine on as it has throughout everyone’s life without pause or alteration. Unfortunately, that is not the case. The sun, as all explosions are want to do – actually changes and sometimes, it gets angry. Scientists have issued a warning recently, that the sun has the capacity to actually spew forth damaging radiation all over the earth. In fact, the last two years were of such unusually high activity, it set records for recorded solar storms. They are calling these unusual solar storms, Space Superstorms. The scientists are worried about GPS satellites. I’m worried about more than that! In my book, QUANTUM STORMS I discuss this possibility of an angry sun – a very angry sun - the ultimate Space Superstorm! What would happen of the sun would change its character for, say, a century? A century in the life of the sun is less than a second compared to our life spans. To the sun, a mere century is less than a hiccup. But what would happen to human civilization if it did? First, check out the latest scientific warnings. 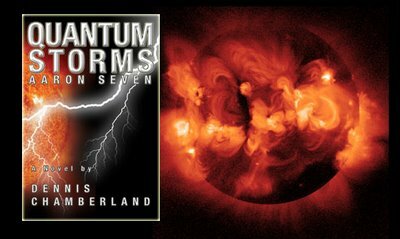 The check out QUANTUM STORMS. Then, go out and see if they sell a One-Million-Rated-Sunblock – we all may be needing it! The Space RACE Is On!